After taking a year off, we are trying our hand at gardening again this summer. Vegetables, to be exact. Our first garden from 2 years ago worked well, but I knew I wanted something a bit larger this time around. I also knew I wanted to use recycled pallets again this year, to keep the cost of building supplies down. Pinterest is a great source of ideas for pallet gardens, but my husband had some ideas of his own. Last month, while Grace was enjoying her first day in her little pool, Joe got to work building 2 garden beds. He used 3 pallets for each bed. He trimmed a small amount off of one side of each pallet, so they would fit together without having to use additional lumber to attach them. Joe has a shed full of tools, yet the chainsaw seems to be his favorite! When trying to think of a title for this post, I considered calling it: How To Build a Vegetable Garden with a Chainsaw. He also cut the pallets in half. Each pallet was eight slats high, we could have gotten more beds out of our stack of pallets, if we cut into each pallet into 4 pieces each two slats high. Since we have a yard full of bunnies, we opted to keep the sides higher to avoid having to buy garden fencing to keep the cute critters out of the vegetables. So far the higher sides are working for us. We'll see what happens as the plants get bigger. So far the higher sides are working for us. We'll see what happens as the plants get bigger. I want to share more photos of our recycled pallet garden beds in action, but this post is already picture heavy! Check back next week to see how they look now! Note: When using pallets for edible gardens, you want to be sure they aren't chemically treated. Check out this article to find out how to find out if your pallets are safe for edible gardens. You also want to be sure that they are free of any spilled chemicals/oils. 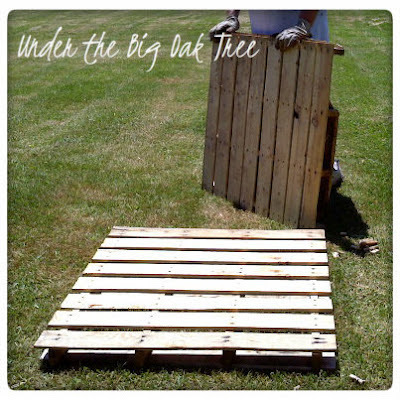 The darker spots on our pallets is from sitting in a muddy spot of our yard. Nice tips for those who likes gardening. Thanks for sharing. I enjoyed seeing how your pallets are being put to use. Thanks for sharing how the plant beds came together. Hope to see the progress as it comes along. Hi Alison and Joe: What a great way to reuse old pallets--I like it. Thank you for sharing it with us, and have a great 4th! Very cool idea to recycle pallets! I love my raised garden beds, but Hubby used planks or wood. I'll have to show this to him because some of our beds need repaired next year. He might like this. I found you in a google search and this was exactly what I'm looking to do. I'm gonna leave a pallet on the bottom as the base though so I can move the bed with a forklift. BTW, I am also a city mouse moved country and love it. I often tell people where I'm from they grow asphalt. God Bless.